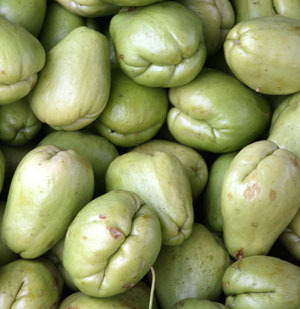 Have you ever eaten chayote (pronounced roughly “chy-O-tay”)? This tropical vegetable is being seen more frequently in Wisconsin grocery stores with the increase in Latino populations. Also called choko, mirliton (or merliton), cristophene in many parts of the Caribbean, mango squash, or vegetable pear, this plant in the gourd family (Cucurbitaceae) is native to Central America but is now cultivated in many parts of the world. Sechium edule was domesticated in Mesoamerica (probably southern Mexico to Guatemala) where it was a staple of the Aztecs and Mayas. Its common name is derived from the Nahuatl word chayotl. By the 18th century it had been spread throughout the Caribbean and into South America, then was introduced into Europe and made its way to Africa, Asia and Australia. 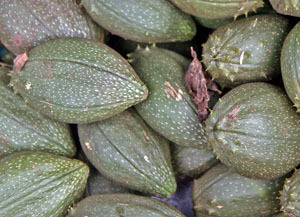 Chayote has also been used medicinally. The leaves and fruit have diuretic, cardiovascular and anti-inflammatory properties, and infusions of the leaves were used to dissolve kidney stones. Chayote is a vigorous, tender herbaceous perennial vine with tuberous roots. 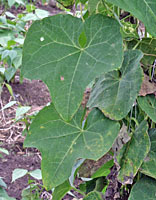 In the tropics the vine can be aggressive, and is even considered invasive in some places, such as Hawaii. The slender, branching stems can grow up to 30 feet long, with rough textured, slightly lobate (with three to five angular lobes) leaves and lots of clinging tendrils. In commercial cultivation the vines are typically grown on trellises about head high to facilitate walking beneath the vines, so the fruit is well-shaped, clean and easy to pick from below. 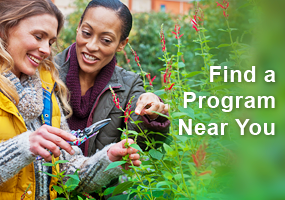 Plants are productive for 3-5 years. Chayote vines growing on trellis system, with tendrils clinging to the wires (L) and fruit hanging down (R). Like all cucurbits, white to greenish male and female flowers are borne on the same plant. They grow in axillary inflorescences, with groups of staminate (male) flowers amid a single or pair of pistillate (female) flowers. The flowers are pollinated by honeybees (Apis mellifera) or the native Trigona bees. Flowers blooms continually if not killed by frost, and are good sources of nectar that make good honey. 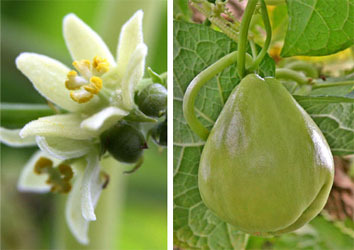 Chayote flowers (L) and fruit (R). The whitish to light green fruits that mature in 30-35 days are somewhat flattened and resemble a mango- or pear-shaped squash. They may vary considerably in shape and size, but the commercially-produced fruits are uniformly smooth (some wild types are covered with soft, shiny, dark-green spines), and have a shallow to deep indentation or fold at the base. Plants yield 25 to 100 fruits, averaging 1 pound each. Each fruit has a single large seed. The commercial types are viviparous, meaning the seeds will germinate inside the fruit as soon it reaches maturity, even when it is still on the plant! This doesn’t happen with the wild types; they germinate after falling to the ground. Dormancy mechanisms probably were lost during the process of domestication in the cultivated types. Chayote are grown in Florida, California, and Louisiana, but most of the ones in our stores come from Central America. They are cultivated on a commercially scale in Costa Rica, Guatemala, Mexico and the Dominican Republic. Commercial trellised chayote fields in Costa Rica. Select firm, smooth, unwrinkled, unblemished fruits that are heavy for their size. Those that are very wrinkled are too old and will likely be dry and tough. Also make sure to avoid any that have a shoot coming from one end (unless you want to try to grow it as a plant). Chayote will keep refrigerated for many days or even weeks. They need humidity to prevent shriveling so keep them in a plastic bag. The fruits are used like a vegetable. The large, ovoid, flattened seed is normally discarded (even though it is edible). The white flesh of wild plants is bitter, but the cultivated form is rather bland. It tastes like a mild squash, with a hint of cucumber taste and a crisp texture. The fruits can be eaten raw in salads, or cooked. This vegetable can be used like summer squash or potato – steamed, mashed, baked or fried – although its denser texture requires more cooking time than zucchini. It can be eaten alone or added to other ingredients, such as in stews, casseroles or vegetable mixtures. Chayote combines well with tomatoes, onions, peppers and corn. The fruits can be halved and stuffed, then baked. They can also be pickled, or even used in desserts. Although the fruit is the most common plant part sold and eaten in the US, the root, stem, seeds and leaves are all edible. The soft seed, sometimes called vegetable scallop, has a nutty flavor and can be sautéed in butter or prepared in other ways. 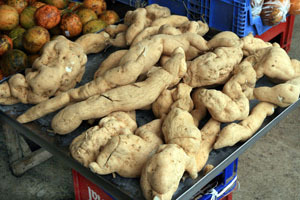 The starchy tuberous roots are comparable to yams and are eaten boiled, baked, fried, or candied in syrup (or are used as cattle fodder in some parts of the world). The young leaves are used steamed or boiled like spinach, while the shoots can be used like asparagus tips. Chayote is quite easy to cultivate, even as an annual in temperate climates, to cover a trellis, arbor, or fence, or as a fast ground cover. But because chayote needs day lengths slightly over 12 hours to flower, they do not flower in temperate regions before fall, so it is unlikely you will ever get fruit in the north. The plant is extremely cold sensitive, so start inside and move outside only after temperatures are consistently above 50ºF. Keep a store-bought fruit at room temperature until it begins to shrivel. 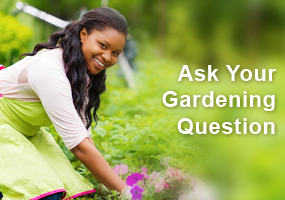 Place the whole fruit, with the narrow stem end up and slightly exposed, in well-drained soil. A shoot should emerge after 2-3 weeks. 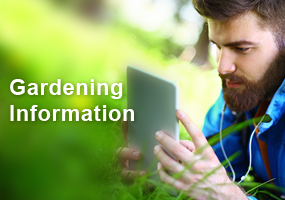 Provide it with support and lots of space as it will grow rapidly. The plants do best in full sun. The related tacaco or chilacayote (Sechium tacaco, right) is native to Costa Rica and is sometimes seen in local produce markets there.